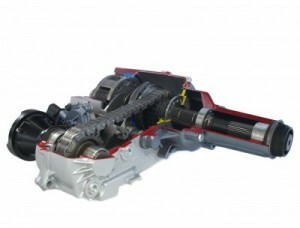 The transfer case is a component found in four-wheel and all-wheel drive vehicles. It plays the role of sort of an intermediary between the transmission and the wheels via the drive shaft, enabling the driver to utilize 4WD. It can also sometimes be called a transfer gear case, and while some older cases were fully gear driven, most modern cases are belt driven today. If you’re the kind of person who depends on their four-wheel drive, be it for off-roading, hauling, or any moment when you need the extra torque and traction. Transfer cases allow each wheel to act individually, which is helpful when turning, but it can also act in a similar fashion to a differential lock. If one tire is stuck or slipping, you can lock the axle so the wheels spin at the same time, which can get you out of a sticky situation. That said, towing and off-roading aren’t the only reasons to have a transfer case or all-wheel drive. There is actually a wide range of transfer cases, all designed for different things. And we can repair each and every one of them in our shop! driving with a bad transfer case can be loud, annoying, and worse, it can have damaging effects on both your transmission and differential. In the history of auto repair, I don’t think anything has ever gotten better by ignoring it if you think you need a replacement transfer case, bring your vehicle by our shop and we’ll be able to tell you what the best action to take is. Oil leaks, grinding sounds, and loss of your 4WD functionality are all signs of a transfer case problem. Come to our shop in Inglewood, CA for a transfer case replacement or repair! As always, you can stop by or call us with any questions you have, and we’ll be happy to help!